You are here: Home / Uncategorized / Tech Tip: Get More Mileage Out of Your Poster Sets! 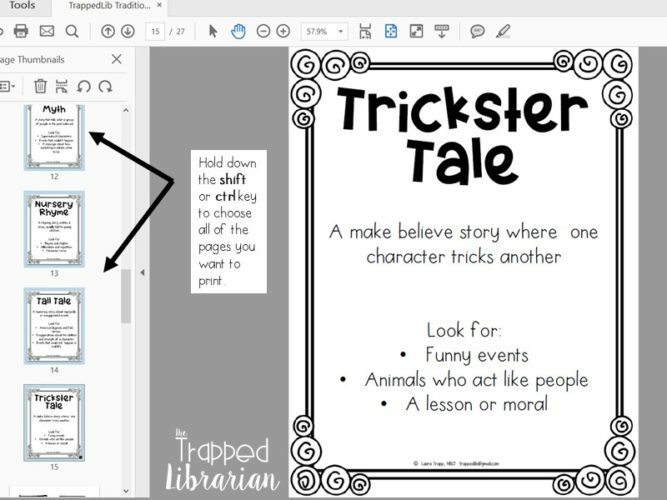 Have you bought or created a set of posters for a bulletin board or a display in your library or classroom? 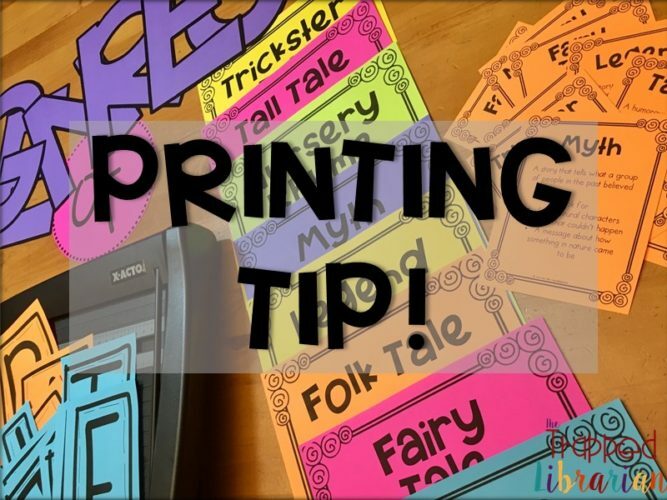 Here’s a time saving tip for getting more use out of the same resource: print the posters at a reduced size and make sets for each group of students. You can easily plan an active learning lesson to reinforce the concepts in the posters. 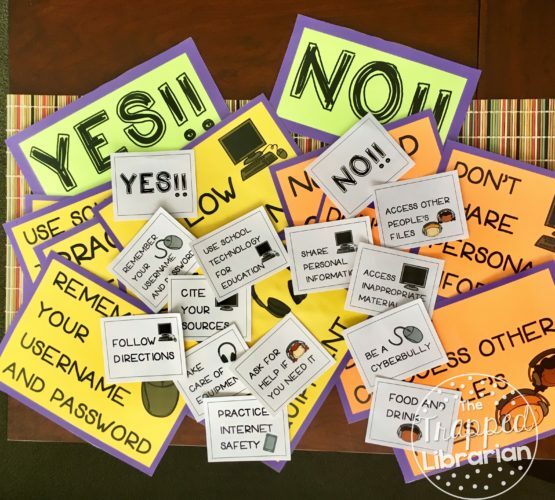 For example, I printed the posters from my Technology Use Agreement resource at 2 x 2 size on card stock and made 7 sets, one for each table group in my library. After showing a slide show presentation and leading a class discussion about our school district’s Technology Use Agreement, I gave each group a set of the cards and asked them to work together to sort them according to the “YES!” and “NO!” guidelines. Afterwards each group could choose one to share with the whole class and give a reason to support their choices. This activity took a limited amount of preparation time on my part, but the hands-on nature of the task along with the opportunity for small group discussion provided a big bang as far as student engagement and a deeper understanding of the concepts. This simple addition to the original resource can make a big difference for my students, turning a “sit and get” lesson into an active learning lesson. 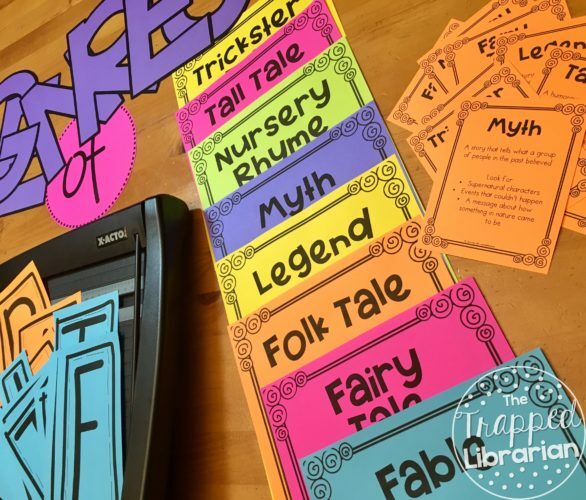 For a lesson on Traditional Literature with my third grade students, I printed the genre posters from my bulletin board set at a reduced size on 7 different colors of bright card stock. I gave each group a set of books (one for each genre) and asked them to discuss the books and the genres and match a card with each book. Afterward we had a class discussion in which students took turns representing their groups as they shared a match and gave a reason for the choice. Again, a hands-on small group lesson like this gives each student a chance to talk about the topic and listen to their classmates in a more meaningful way than just looking at a bulletin board and reading the posters! 1. Choose just the pages you want by holding down the shift or ctrl key while you click on each page. 2. On the print screen, under Page Sizing and Handling, click on Multiple. 3. 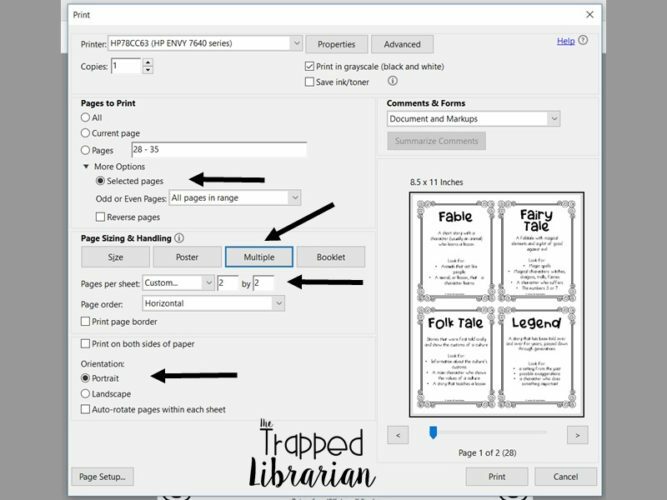 Next to Pages per sheet, choose Custom, 2 by 2. 4. You can see the layout for your pages on the right! 5. Click Print and voila! Your mini posters/activity cards will be ready! I bet you have a poster set that you can turn into an active learning lesson! Let us know how you use this trick in the comments below!